Colin Kaepernick donated 50 free suits to a Jamaica-based organization. While Colin Kaepernick is looking for a job himself, he is also trying to help those less fortunate get one. The former San Francisco 49ers quarterback recently donated 50 suits to 100 Suits for 100 Men, a Jamaica-based organization assisting formerly incarcerated men and women by helping them get jobs and giving them free business attire, haircuts and job training. Kaepernick and Hot 97 host Nessa brought two large boxes filled with custom-made suits to Jamaica, dropping them off in front of a local parole office last Saturday, the group said. “We are very honored to have his items donated,” said Kevin Livingston, the president of 100 Suits for 100 Men, who established the organization in 2011. “He is very humble and he genuinely cares about the community," Livingston said about the athlete, who is also known for his protests against racial injustice by sitting down or kneeling during the national anthem at games. “That's love!!!! When you have Superbowl quarter back Colin Kaepernick and Hot 97 host Nessa personally drop off over two huge uhaul boxes of custom made suits at our office @ Queens parole,” the group wrote on its Instagram page. Know Your Rights Camp, a campaign for youth started by Kaepernick, posted a video showing the quarterback as he brings the suits to Jamaica. Colin Kaepernick donates custom-made suits outside a New York City parole office 🙌🏽 Via usatoday.com: The start of the NFL season is about three months away and free agent Colin Kaepernick is still on the market. While he waits to see if he’ll get signed, Kaepernick is keeping up with his commitment to help empower communities in need. 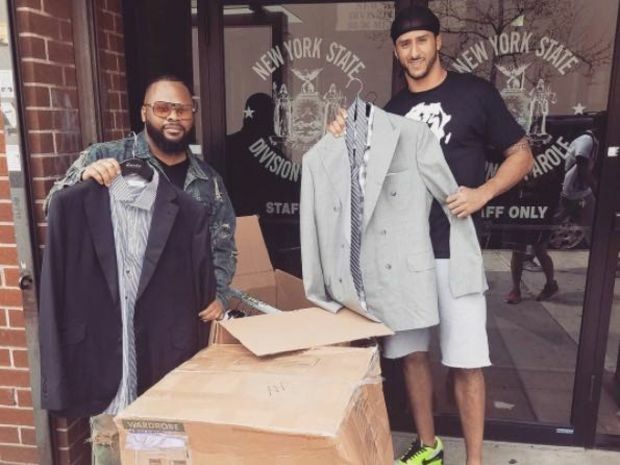 About two days ago, Kaepernick stopped outside of a New York City parole office and donated two large boxes of his custom made suits. The donation benefits 100 Suits, an organization that provides free business attire to men and women who are in the job search process. The Instagram account for 100 Suits posted that the quarterback was at parole office in Queens. That’s love!!!! When you have Superbowl quarter back Colin Kaepernick and HOT 97 host Nessa personally drop off over two huge uhaul boxes of custom made suits at our office @ Queens parole. 100 Suits hopes to reduce recidivism rates by helping people find more gainful employment. By being able to wear appropriate suits to their interviews, these men and women are better equipped to achieve gainful employment, which will ultimately help them to transition into mainstream society and live more productive lives. Through this program, we also provide free hair cuts for men and wig referrals for women, where needed. Because it’s never easy to find a suit that fits perfectly off the rack, 100 Suits also provides an in-house tailor that will make any alterations needed for clients. Remind me again why Kaepernick doesn’t have an NFL contract yet? “By being able to wear appropriate suits to their interviews, these men and women are better equipped to achieve gainful employment, which will ultimately help them to transition into mainstream society and live more productive lives,” the campaign wrote on its Instagram page. "While he waits to see if he’ll get signed, Kaepernick is keeping up with his commitment to help empower communities in need," the post also read.